MiniArt is a very interesting model company from the Ukraine that produces some of the most detailed models on the planet. I had the pleasure of meeting the owner/designer at a recent trade show and it was clear that this company has taken the art of modeling to a whole new level. You've probably seen their initial offerings which are combinations of structures (wrecked or otherwise) and groundwork to create some very innovative diorama or vignette display bases. They expanded this artwork to figures which are some of the nicest and lifelike figures produced in 1/35 scale (in any medium). More recently they've expanded their focus to tanks and utility vehicles with each one better than the last. This kit is no exception. 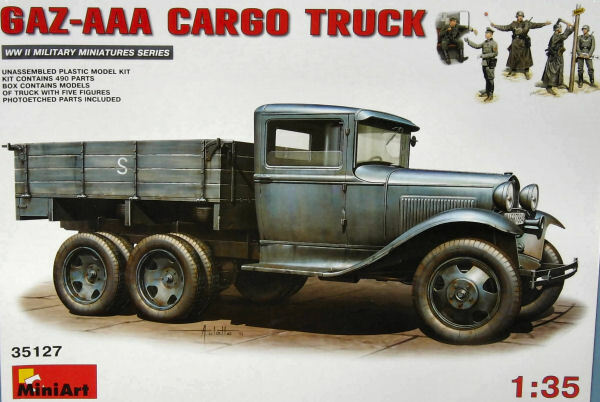 This release captures the GAZ-AAA (Ford Model A truck modifed into a two-ton+ cargo hauler) which served in civilian and miliary service within the Soviet Union. 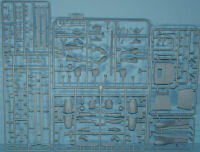 Molded in light gray styrene, the kit is presented on 16 parts trees plus one tree of clear parts and one small fret of photo-etched parts. The kit consists of numerous tiny parts (like the U-bolts which hold the frame rails together) so this kit is definitely recommended for experienced modelers. The level of detail in this kit is similar to the Tamiya 1/12 Forumla One race cars, and perhaps even more detailed. From the engine and transmission to the drivetrain and suspension, all of the details are here. About all you're missing is the wiring harness and that can be easily fabricated by the AMS modeler. Construction starts with the chassis and it is highly recommended that you take the extra time to square and align the frame so the model will sit properly after assembly. If you have a jig for this job, so much the better. The same care will be needed for the twin-axle assembly to again ensure that the model is square. Each of the tires build up from seven disks, three on one half and four on the other. These go around 12 wheel hubs to create the ten wheels and two spares used by this truck. These separate tires and wheels will make painting much easier. The only bug I found in the instructions were where the spare tires are mounted to the underside of the truck bed where the illustrations show the spare tires mounted to the frame rails under the truck bed. This is easy enough to fix.